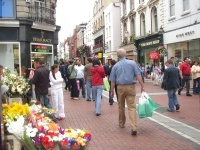 If you are considering a short break Dublin Ireland, you've come to the right place for everything you need to plan a weekend getaway in this great Irish city. Our family spent some time here several years ago and not normally being a "city girl", I really enjoyed Dublin. It didn't seem so big and overwhelming to me. We flew into Dublin for our Ireland family vacation, rented a car, spent a couple of days in the area, explored on the way to Dingle Peninsula....then around Shannon, where we flew back to the U.S.. I would highly recommend this itinerary for Ireland holidays. You'll get a fantastic look at the "Emerald Isle", truly a BEAUTIFUL country! Beech Lodge B and B - Gerry is a great host at this clean B&B which is only 10 minutes from the center and includes a delicious breakfast. Kilmainham Gaol Historical Museum - This prison tells the story of Ireland's troubled path to independence and has been designated a National Monument. Interesting tour. Put this on the list for your short break Dublin. Newgrange, about 45-60 minutes north of Dublin, is the sight of a Megalithic Passage Tomb built about 3200BC! Our family visited this interesting place on our holiday in Ireland. We stayed in Navan (between Dublin and Newgrange) at the lovely Boyne Dale B&B - (boynedale@iolfree.ie). We stayed for a couple of nights and took one day to explore the Newgrange area and the second day we spent in Dublin. I have read that Mary Gibbon's tour of Newgrange and Hill of Tara are excellent. If you would like to experience the beautiful Wicklow mountains (about an hour South of Dublin airport), consider the lovely Wicklow Way Lodge. This would be perfect for a romantic getaway....very peaceful and a great walking base. If you are looking for someplace to eat on a romantic break, check out One Pico Restaurant featuring modern Irish cuisine with French influences, Pearl Brasserie for its unique atmosphere and good food or Blackboard Bistro with its French Bistro feel and changing menu of food made with fresh ingredients. The Winding Stair Restaurant has contemporary Irish food and is very popular. Italian food lovers try Il Baccaro a quaint restaurant which is a favorite of the locals. You must check out a pub on your short break Dublin, so try Brazen Head which is the oldest pub with lots of atmoshpere. For Irish music there is Hughes Bar, O'Donoghue's or Cobblestone. I hope you enjoy your short break Dublin as much as we did!